One hears stories of headaches and silent death, worry over spontaneous combustion of particles, and faulty equipment. But with the Hero what you get is a warm shop that’s quiet enough to hear your music and so easy to work around you forget the damn thing is there. It’s been employed at the wood shop for about a month and change now, and of the 20 or so times we’ve cranked it up the shop is an average of 20 degrees F warmer with it on than not– so 50 turns to 70,nwhich is perfect, and 30 turns to 50 which is a ton more workable than sub-freezing temperatures. That’s not to say the Hero is the ultimate solution, either. The draft at the door leaves about the front third of the shop pretty chilly with a good breeze, and the far corners are still about 10 degrees cooler than the middle of the space. But still, it takes the edge off, and what used to be ball-freezing hell is upgraded to mildly uncomfortable at worst and downright toasty in the working space. For the $180 buy-in, plus gas cost, it’s an extremely versatile and portable way to force the cold retreat while you get some work done. I have been using a tank top radiant heater for a couple of years. The thing makes a lot of heat but sadly, with no fan, most of the heat just goes straight up rather than warming me. I have contemplated the creation of a small fan behind the heater to move the air around a bit. I have eave vents in my shop space so don’t worry much about using propane. A CO detector was added 2 years ago, just in case. I will certainly be looking at the Mr Heater (and hoping for a bit better pricing) before next winter. Too late for this winter – I’m already frozen and won’t fully thaw until July or August anyway. What are others doing to heat up that cold space? Similar to you, I’ve got a a couple of propane radiant heaters, the Mr Heater Big Buddy (bought first) and Lil Buddy (newer model) heaters. I know I picked up the Lil buddy at the end of the season when it was on sale/clearance, and I think I got the Big Buddy around the same time a year or two prior. They’ve both been great to take the chill off, but in larger enviroments (a garage) they’re just a little too small and don’t project the heat well enough. So, I just picked up the Hero heater on clearance at my local Menards. They’ve got them priced at $125, which is great considering I thought they were a good deal when they were on sale earlier this season at $150. This winter has been milder than most, so they seem to be clearing out the winter gear earlier than usual. It still gets cold, so I’m thinking I might actually use it before next season! That would be my advice; go look for one now, and you could get a good deal; maybe even use it to thaw out a bit sooner than expected! I have been using a tank top radiant heater for a couple of years. The thing makes a lot of heat but sadly, with no fan, most of the heat just goes straight up rather than warming me. If your heating a space like that you need to throw some serious BTUs to even think about getting warm. Get yourself something like a Dayton 6BY74 or L.B. White WORKMAN 225. They go for around the price of the Mr heater and throw about 5 times the heat. Turns the average below freezing two car garage into a sauna in about half an hour. Oh, I won’t miss whacking my fingers in the cold after I get my shop furnace hooked up. But hey, if your fingers are numb you won’t feel the saws nibbling on them! I still prefer the kerosene salamander. It seems to be more economical than its propane brother, which I also have. The kerosene models when in good operating condition don’t make a big stink (as some people insist), are self contained and run a surprisingly long time on a few gallons of fuel. The required ventilation is the real killer with this thing. Claims to need 1ft open at the top of the room and 1ft at the bottom (on the instructions tag). If you don’t have the ventilation you’ve got a slow, but real, carbonmonoxide risk (at least, that’s what I understand – could be wrong). Love how warm it is – with the battery capability its especially nice for tailgating. That’s how we tested it over at OPC. Created a pocket of warmth about 5ft. out from the unit. Unfortunately, we don’t have the ability to create proper ventilation in our garage, so while it works to heat it up, I’m just not comfortable with the emissions. 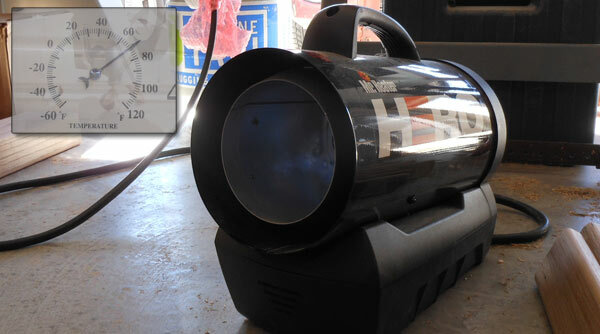 I’ve been running the Mr. Heater Hero (Variable 30K to 60K Model)for almost 5 years during Canadian winter months in my garage shop (400 Sq.Ft.) which is separate from the house. This unit performs amazingly with NO issues. Original battery is still going strong. The Carbon Monoxide issue: My shop has a few very minor air leaks but it seems to provide adequate ventilation. I also purchased a battery operated CO2 monitor/alarm (household type) and mounted it on a wall about 8 inches off the floor (Carbon Monoxide is heavier than air)to sound a warning if CO2 levels were to rise to an unacceptable level. In 5 years, the alarm has gone off only once while the heater was running but I was also soldering copper pipe at the time. The alarm will give you adequate time to shut the heater down for a time and leave the area. I always push the test button on the alarm to insure it’s working before the hero is turned on.